No time for lunch? We’ve got your back. Order online and we’ll have your lunch waiting for you! Two locations: One Market Plaza and 30 Battery Street. This month our new menu specials are inspired by Korean flavor profiles. Introducing our new Korean Ahi poke. We start by butchering our handline caught ahi from the Marshall Islands (MSW green catch) and then marinading it in our special gojuchang sauce. Throw in some bean sprouts and a few cucumbers and this poke is magic in your bowl. We all know that it wouldn't be legit unless we had kimchee to offer, and so we proudly present it two ways. This lunch will transport you to Pyeongchang with one bite. Well, ok it won't, but one can dream. Enjoy! Ready for a tropcial twist on iced teas? Yeah, we thought you might be. This week we introduce our housebrewed tropical teas: Guava Jasmine tea and Mango Hojicha (roasted green) tea. Both teas are fruit forward, just slightly sweetened and will make you feel like you're about to board a plane to Hawaii. Just close your eyes, sip on this and day dream for a few minutes. We got you. A delicious and perfectly balanced bowl for all our health conscious guests. We began the year with the introduction of two new side dishes (baked tofu and marinated bean sprouts) to encourage healthy eating. Today we present one of the many ways you might consider constructing your next super healthy bowl. Tombo - (aka albacore or "white tuna") a great source of essential omega-3 fatty acids that lower your risk of heart disease. It's also "a better source of heart-healthy omega-3 fatty acids than other tuna species" according to the SF Chronicle. Miso kale - you already know the amazing health benefits of kale, but did you know that miso is rich in probiotics? Our house made dressing is good for the gut. Seaweed salad - packed with minerals including calcium, iodine, iron, magnesium and vitamins A, B and C to name a few. Haiga rice - milled to remove the hull, but not the germ. We like to call it "light brown" rice as it retains some nutritional value of brown, but retains the sticky texture of white sushi rice. All that goodness in one bowl will definitely fuel your afternoon. How will you style your healthy poke bowl this year? Thanks for a great first year San Francisco! A year ago we opened our first San Francisco location at One Market Plaza. We’ve had an amazing year first year and are deeply grateful to our entire crew for all their hard work, dedication and smiles. We’d also like to thank you, our loyal guests for all of your love, support and encouragement. You’ve told us that you can taste the difference in the freshness of our fish. Whether you were a fish connoisseur before you tried Coast or have blossomed into one after multiple bowls of poke, you won't compromise quality over quantity, and that alone is why we do what we do. Looking ahead we have exciting seasonal menu changes in the works along with a rotating dessert menu to keep things interesting. Here’s to another great year San Francisco, we love you! For the uninitiated a musubi is kind of like maki sushi (aka sushi roll), except that maki sushi rice has been seasoned with rice vinegar, while musubi rice is lightly seasoned with salt. In Japan you’ll find musubi with a variety of different fillings including umeboshi, konbu, canned tuna w/mayo and yes, salmon. We set to work in our test kitchen to create a mini salmon musubi that would impress and we’re excited to introduce it today as a premium side ($1). Our house made cured salmon explodes with flavor. To kick it up a notch we add just the tiniest bit of kewpie mayo, a pinch of our magical spices and a little jalapeno to make things interesting, if not down right addictive. We can’t wait to hear what you think of it. New Year. Healthy vibes. Life is good. Healthy vibes in 2018. From top to bottom: bean sprouts (new! ), baked tofu (new!) and the much anticipated return of our famous edamame guac! This year we cast aside fad diet(s) and resolve to simply eat healthy. Yes, of course we’ll also vow to drink more water, exercise and sleep 8 hours a night. But first things first: LUNCH! This month's menu specials usher in the New Year on a healthy vibe. We are excited to launch two new sides that please the palate and the body. Baked tofu (premium side) - We marinate our tofu in a light Aloha Shoyu dressing and firm it up a touch in our oven. Low in fat and high protein, this the perfect side for those looking to boost their bowl with a bit more protein. The return of the guac! Back by popular demand, our famous edamame guac rejoins our line up of sides. Talk about heart healthy, we make this on site with all natural ingredients: edamame, avocados, water chestnuts - maybe a dash of togarashi to jazz it up. Yaaas! To make room for these three sides, we bid adieu (temporarily) to the roasted kabocha, ube and the Hawaiian mac salad. Don't worry, they'll be back next Oct.
We have more surprises in store this month. Stay tuned. 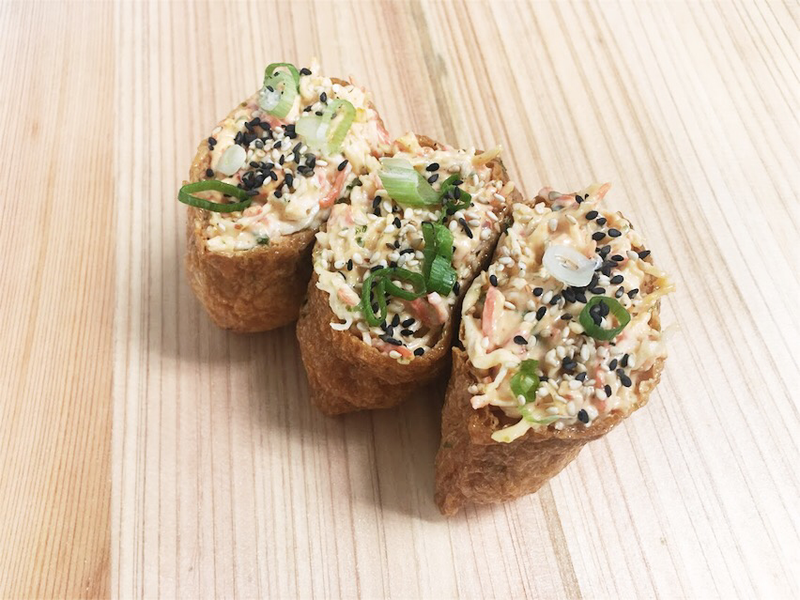 Our poke rotation continues and this month we're excited to intro the Ginger Tombo. It draws on the flavors of a sushi bar experience with simple ingredients that place the emphasis on the fish. Albacore (aka Tombo Ahi in Hawaii) is much lighter in color than its cousin the yellowfin and is more delicate flavor. For this poke, we've gone with a simple Aloha Shoyu marinade with fresh ginger and green onions. Chef recommends pairing this poke with miso kale, inari, our imit crab salad and sunomono. Top it off with our housemade fried wonton strips and you're good to go! Love to hear what you think of this new addition to the lineup! Our pursuit of seasonal flavors continues and this month we charge into October with a hefty line-up. We’re proud to introduce richer flavors and new textures, with an eye pleasing palate of fall colors. Headlining the menu for a limited time: Black Garlic Shoyu Salmon. Bon Appetit’s Amiel Stanek describes black garlic perfectly. October poke special: Black Garlic Shoyu Poke. Photo only shows poke. This is not a complete bowl with base or sides. We’re proud to present Black Garlic Shoyu Salmon poke which features fresh salmon, hand-cubed and tossed with our housemade black garlic sauce, roasted ube and sesame seeds. Turning our attention down the line, we find a supporting cast of new sides that are equally impressive. Organic miso kale. Seriously, even people who don’t like kale, will like this. Macaroni salad. Nothing fancy, just a simple Hawaiian style mac salad that makes our aunties in Pearl City smile. Roasted ube. This sweet purple potato is back in season and we love it! Roasted kabocha. Sweet Japanese squash that’s loaded with vitamin A. TBT it tastes more like a sweet potato but we devour it just the same. Spam musubi. Keepin’ it real, people. This one is an island favorite. Please note that we’re temporarily pulling a few sides (shredded daikon, tamago yaki, edamame guac) from the line to make way for these seasonal faves, but they’ll be back soon! Finally, over in our grab and go, you’ll find a new addition to our Inari Bomb Collection. Say hello to the Spicy Crab Bomb. Spicy imit. crab salad stuffed into an amazing little pocket of fried tofu with sushi rice. It’s truly is da bomb. We look forward to hearing what you think of our new line up. Have a great week! If you've made the trip to the North Shore of Oahu - you may recall seeing a number of shrimp trucks parked in the town of Haleiwa or Kahuku. That's precisely where Chef Kelly drew inspiration from when local Bay Shrimp season arrived. On the North Shore you'll find Giovanni's Shrimp Truck, Camaronshrimp and Famous Kahuku Shrimp Truck to name a few faves. Each has their own spin on amazing garlic sauces, many with a nod to the infallible scampi recipe. We're proud to present our take on the dish featuring local Bay Shrimp catch which is in season through October. The fresh bay shrimp is so sweet and briny we don't need to dress it up much. A little lemon, garlic, butter and parsley and you're set. This poke is amazing over a bed of mixed greens with a side of tamago yaki, edamame guac, inari sushi and seaweed salad.